​Stores tailor the system by configuring their departments and populating their lists; Staff/Suppliers/Hot Cooked Foods/Equipment (Fridges, Freezers, Coolrooms and Scales). They publish the store specific detail to the eLog template which then appear on their tablet. As they complete the detail and submit the elog on the tablet the data automatically appears in their dashboard. 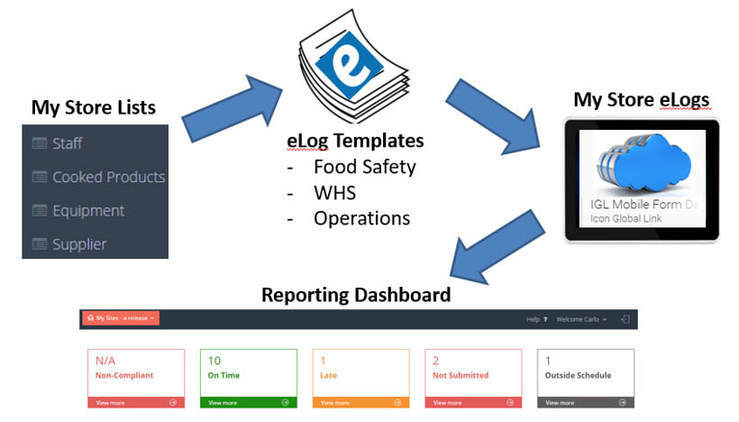 The dashboard enables the store to schedule elog sheets to have real-time visibility and accountability, as well as allows the store to manage corrective actions and email alerts.